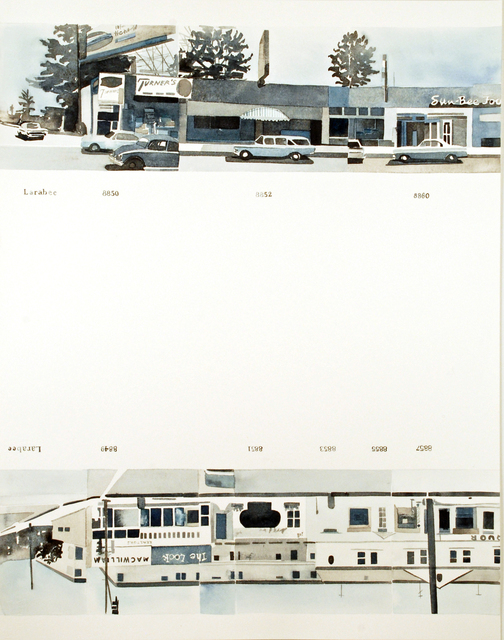 Morgan Lehman is pleased to present Amy Park’s Ed Ruscha’s: Every Building on the Sunset Strip. This will be the artist’s third solo show with the gallery. The year 2016 marks the fiftieth anniversary of the publication of Ed Ruscha’s twenty-five-foot-long accordion book, which remains one of the most iconic artist’s books of the past century. 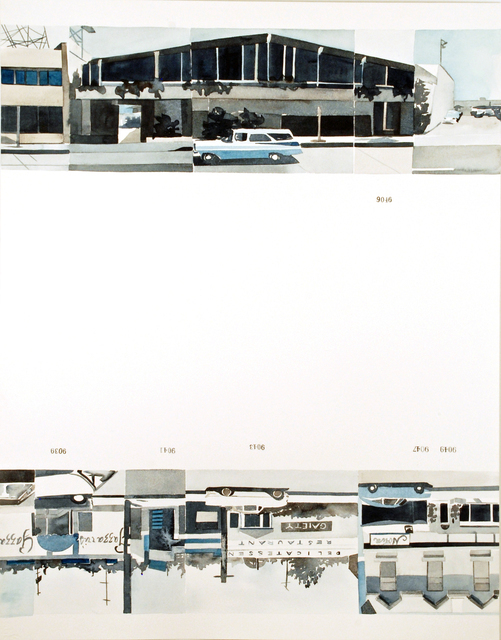 Park’s undertaking, to scale up and recreate every single page of Sunset Strip in watercolor, is equal parts homage to Ruscha, conceptual deconstruction of a historical document, and musing on the nature of the photographic image. Today, the Sunset Strip is much like Times Square: filled with bright lights, excessive advertising, and tourists. 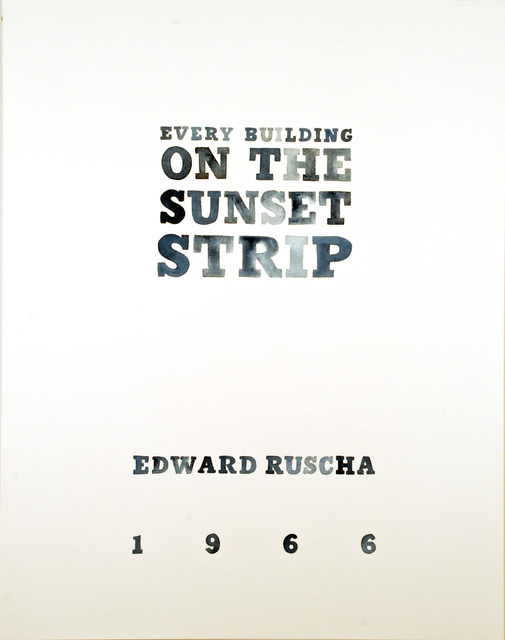 However, in 1966 this mile-and-a-half stretch of West Hollywood was far sparser and quieter, a subject well suited to Ruscha’s austere yet pop-inflected vision. 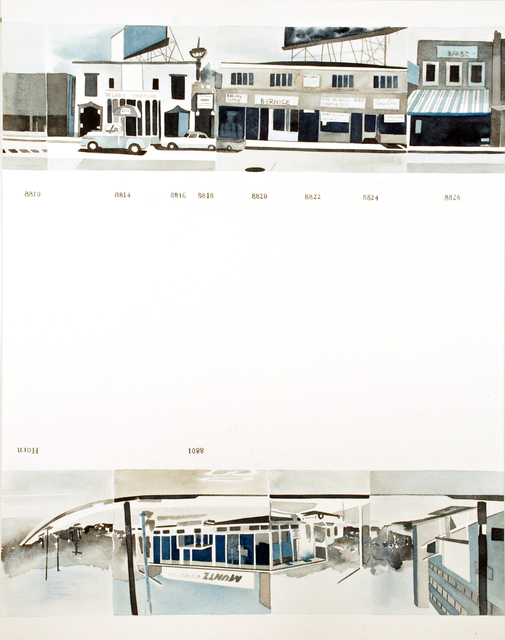 Park maintains the monochromatic color tones of the original black and white photography and consciously plays with the deadpan frontality that Ruscha brought into focus. The photographic sequence is not seamless, resulting in distinct breaks between images and lending Park’s watercolors a truly abstract quality as the viewer moves from piece to piece within the gallery space. In this sense, the installed work extends the notion that the images cannot be taken in all at once but must be seen sequentially, mimicking the way one might really experience the architecture while driving along the Sunset Boulevard. 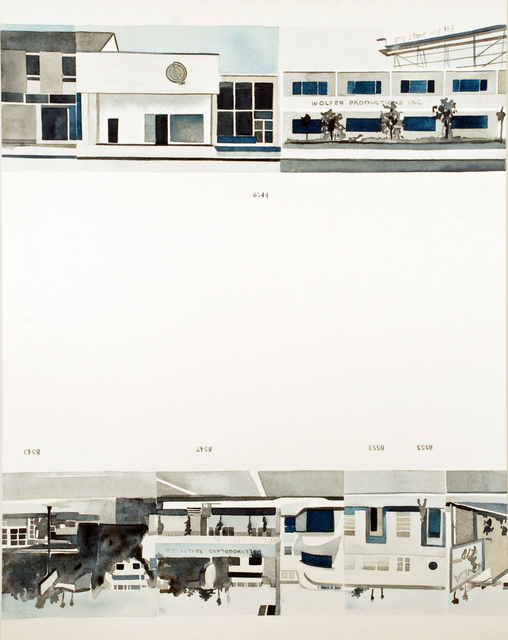 Ultimately, this project links back to Park’s main concerns in the studio: finding her muse in the photographic, proposing that the abstract does exist in various modes of representation both mechanical and handmade, and delighting in the fastidious labor of the translation from eye to hand, and hand to eye. Amy Park was born in 1972 in Warren, Ohio. She received a BFA in 1999 and an MFA in 2003 from the University of Wisconsin-Madison, and also studied at the School of the Art Institute of Chicago and Ox-Bow Summer Art School. She was a recipient of a Marie Walsh Sharpe Space Program Award in 2007-2008, and an Artist-In-Residence at the Serenbe Institute in 2012. Her work has been exhibited widely in the US, including Morgan Lehman Gallery, New York, NY; Steven Harvey Fine Art Projects, New York, NY; The Suburban, Oak Park, IL; at Project Row House, Houston, TX; The Poor Farm Experiment, Manawa, WI; and Kopeikin Gallery, Los Angeles, CA. Her work is in the permanent collections of Fidelity Investments; The Cleveland Clinic; Deloitte and Touche USA; Microsoft Corporation; The College of DuPage; and Drawing Center’s Artist Archive at the Museum of Modern Art. She lives and works in Long Island City, NY.